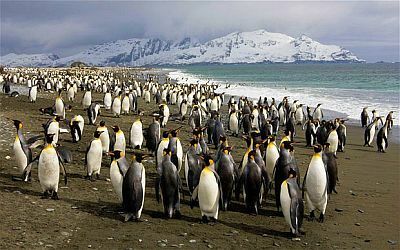 In South Georgia, an island of the southern Atlantic Ocean administered by the United Kingdom, the climate is maritime subpolar, in fact the average temperature of the warmest month, February, is just 6 °C (43 °F) in the largest city, Grytviken. Winter is cold, and the daily average of the coldest months is around freezing (0 °C or 32 °F). Here are the average temperatures of Grytviken. The island is exposed to the intense and incessant flow of the westerly winds, which bring disturbances, able to cause rain or snow throughout the year. The annual precipitation amounts to 1,400 millimeters (55 inches) per year in Grytviken, and it's well distributed throughout the year, although it drops slightly below 100 mm (4 in) per month from September to January, that is, between spring and early summer, while it hovers between 115 and 145 mm (4.5 and 5.7 in) per month between February and August, that is, from late summer to late winter. Given the temperatures, snowfall is more likely from mid-April to October, but sometimes it can occur also in summer, even at sea level. Gale force winds may blow throughout the year, and the humidity is consistently high. The amount of sunshine is scarce, especially in winter, when the sun is almost never seen. At sea level, the temperature can drop a few degrees below freezing even in summer, while in winter it can drop to -10/-12 °C (10/14 °F) after outbreaks of Antarctic air masses. However, owing to the fact that after a while the westerlies start to blow again, usually the severe frost doesn't last long. On the other hand, in South Georgia it practically never gets hot: the temperature can reach at most 20/22 °C (68/72 °F), from November to March. In inland areas, where there are hills and mountains, the climate gets colder, and given the low summer temperatures, glaciers cover most of the island from an altitude of 300 meters (1,000 feet) above sea level, and some glacial tongues descend by gravity to the sea. The more you go up in altitude, the easier it is to see the snow falling even in summer. The highest peak is Mount Paget, 2,935 meters (9,629 feet) high. The sea is very cold throughout the year, and in winter and spring it approaches the freezing point, although the sea, being salty, freezes at about -2 °C (28 °F). The best time to visit South Georgia is the austral summer, from December to March, and especially from January to March, when temperatures are higher. It must be said that in this period the weather is not always clement: the temperature is low, it can rain, the wind often blows, and in inland hills and mountains (but sometimes even on the coast), it can snow. It will therefore be useful to bring warm clothes, hoping to have the chance to remove some of them on warmer days, when the temperature can approach 20 °C (68 °F). In winter (June to August): bring warm clothes, a fleece, a down jacket, a wind jacket, a warm hat, gloves, a scarf, a raincoat, hiking boots. In summer (December to March): bring warm clothes, such as a sweater, a raincoat, a down jacket, a hat, hiking boots; the outwer layer can be removed on warmer days. For inland hills and Mount Paget, warm clothes like in winter.